As you probably know, actor Omar Sharif died today at the age of 83. I’ve written about Mr. Sharif on this site before, and there is no reason to whitewash him just because he’s dead and not about to meet the non-existent allah. Yes, he was a great actor. But as a person, not so much. He was an arrogant convert to Islam and gambling addict, who was banned in the Islamic world for kissing a Jew in one of his movies. Sharif was born Michel Demitri Chalhoub, a Greek Catholic Christian. But he converted to and embraced Islam to marry Egyptian Muslim actress Faten Hamama. But Islam didn’t embrace him, as he–crime of all crimes!–kissed a Jewish chick, Barbra Streisand in the movie, “Funny Girl.” He also had an affair with Streisand during filming. (I personally take offense at anyone who kissed La Nose, but not because she’s Jewish. Actually, she’s a Va-JINO (my name for female Jews In Name Only like her).) And Sharif became a gambling addict. Gambling is haram (forbidden) in Islam. He said he did many of the movies in which he acted, so that he could pay off gambling debts. But Sharif acquired a taste for Islamic-style violence, so it’s fitting that he played Sherif Ali in “Lawrence of Arabia,” in which the British T. E. Lawrence encouraged pan-Arabism and put into play the modern Middle East chaos. In 2007, as I noted on this site, Sharif was arrested for and convicted of beating a Beverly Hills parking lot attendant because the attendant didn’t accept Euros as payment. He broke the guy’s nose. And some chump of a judge sentenced Sharif to take an anger management course . . . AND allowed him to take the course in Egypt. Um, isn’t Egypt one of those countries where they teach anger chaos-ment? As I noted then, anger management in Egypt is when you shoot just two Jews instead of ten. Or when you only honor kill your daughter . . . not also your wife. Mr. Sharif might have been good as Nicky Arnstein in “Funny Girl” and Yuri in “Dr. Zhivago.” But he spent the pathetic last decades of his career promoting Islam and jihad in third rate cinematic hate and living out that hate in real life, beating up the infidel parking lot help. Oh, and writing a syndicated bridge column doesn’t make you civilized. So, I, for one, will not be mourning this al-schmuck. Omar Sharif of Angerabia, buh-bye. Your mind was already dead for decades. *** UPDATE: The openly pro-HAMAS/Hezbollah, anti-Israel group, the Muslim-dominated American-Arab Anti-Discrimination Committee (ADC) just put out a press release lamenting Sharif’s death and noting he raised money for the group. ADC praised Sharif for championing the Muslim immigration/alien invasion of the West and for receiving its lifetime achievement award during a ceremony at which Hany Abu-Assad, director of pro-homicide bomber movie, “Paradise Now,” and Osama Siblani, Hezbollah agent and publisher of the anti-Semitic Arab-American News, also received ADC awards. John Conyers was the keynote speaker at the event. 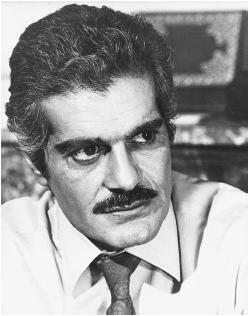 The American-Arab Anti-Discrimination Committee (ADC) offers its condolences to the family and friends of legendary Arab actor Omar Sharif . . . . ADC remembers Omar Sharif as a groundbreaking Arab actor and recipient of the ADC Lifetime Achievement Award. ADC presented Sharif with the ADC Lifetime Achievement Award at the annual ADC National Convention in 2006. For two successive evenings, Sharif charmed the audience . . . and spoke about his experiences as an actor in Hollywood and as a prominent Arab in international circles. He championed ADC’s work and encouraged a chapter to protect the civil rights of millions of North African immigrants in France, where he resided prior to his death. Their guy ain’t ours. Got it? All the nice things being said about Omar Sharif makes me… wanna vomit. He was a decent actor, but that did not make him a decent human being. Fortunately, he will no longer be able to spread his antisemitic and anti-Western bile. I wish Debbie would poop on people more when they’re alive, not dead. Pooping on the dead leaves a bad taste in my mouth. As a matter of fact, she has called out such public-figures who’ve been shady and with skeletons in their closet whilst they’re alive or were alive, so no, she doesn’t have to necessarily wait until they’re dead. And did you read the entire writing, many years ago when Mr. Sharif was alive, she called him out on his wrong-doings, which she (Ms. Schlussel) provided evidence in the writing to clarify her stance! Yes, and Debbie has even included a link to her previous writing about this person. And the admonitions not to speak ill of the dead? Where did this come from? The study of history wouldn’t be worth very much if we followed this poor advice. Death doesn’t change the kind of person someone was. Oh my gosh, thank you for letting us know the paucity of your brain capacity and for letting us know you’re a fraud. You whingers who whinge RE: calling out the dead are indeed frauds. I’m glad DS isn’t one of them and that’s how I roll, too. If you want people to sing your praises when you cark it, then live that way. Why is it our fault when crappy peeps get called on the carpet for their dodgy way of living? You gotta walk it like you talk it to get the hallelujahs! I’m glad to know this about deadsy, old Omar. I had wondered what his story was of late. The fact that he embraced Islam says it allllllll! Glad he gambled…that seems like such a Mooooooooslim thing to do since it’s satanic if it gets it’s hooks in you. Excellent synopsis and smack-down, skunky. I.I.N.M., Sharif prior to his death had developed Alzheimer’s. Poetic al-justice, I suppose one can say . . .
You evil,stupid woman. You are so shameless that you wont even stop spreading hate and false accusations for the deceased. You have truly shown your colour. First of ally out not a gentleman,talking this way to a well educated with hi IQ Lady.Second of all he is a trader to his religion,no religion accepts gambling.Dead or not dead he was a actor,in the same time he was a arrogant person.Thanks Debbie for nice article. You evil,stupid woman. You are so shameless that you wont even stop spreading hate and false accusations for the deceased. You have shown your true color. Ha! What a perfect example you are anonymous. Your double post is so fitting since you whiny liberals are nothing but a broken record, constantly repeating the same drivel, never being able to contribute something new to the discussion and always ignoring the facts, and that’s just the tip of the iceberg. HaHa.I like the metaphor you have used but who says I am a liberal ? I find it terribly appalling that this woman is shaming a deceased man with false accusations by saying he “gambled” and “islam did not embrace him “. How do you prove that ? Ironic how you are saying I am ignoring the facts when there are no facts to begin with. And unlike her and most people on this site, I refuse to treat him as a subhuman because of his religious belief. Perhaps, Debbie would not mind people talking ill about her after her death. I do not wish to waste any more time arguing but I hope you understand where I am coming from. I thought Dr. Zhivago sucked.